I have a problem in the comments! Comments are not displayed by default for all . Is displayed only for those who write comments! I suppose that you want to turn on the option "Users must be registered to see other comments" in the Features tab of the HikaShop configuration and that should display the comments for everyone. Can you try to reproduce this configuration ? - And reproduce this configuration on the screenshot, and especially those which are red framed. Hope this will able your customers to see all comments in all case. Last edit: 2 years 8 months ago by Philip. my setting like this setting(your picture), But already exists problem! Quite strange, it is the first time, I heard about an issue like this ! Can you provide an url link, in order to see it by ourself and process some tests ? Right now I have to go more far, can you provide some back-end access ? This time thanks to use our " Contact Us " form to provide this elements, and don't forget to put in your message an Url link to this topic. Please try to rename the folder templates/YOUR_TEMPLATE/html/com_hikashop to something else via FTP and try again. Does it work ? If yes, then the problem comes from your template view overrides and you'll have to check with your template provider. It looks like they have view overrides that are outdated, and that what is causing the problem. But comments will not be displayed! This problem relates to Hikashop component, so please contact them for more information first. Because we use Hikashop as a third party component. After that, if it is due to our template, we will help you. Last edit: 2 years 8 months ago by sonic69. Then, could you provide a link to a product page where the comment doesn't work and where you use the protostar template? Because with all the customization of the template, it's hard to understand what does what and where it could come from. Previous comments will not be displayed! But in this case I will comment when it works properly! Even when the name com_hikashop've come to a previous state.Comments are displayed correctly! So could you provide a link to a product page with the default joomla template ? Does it work with the default joomla template ? "Missing value for the comment or the vote value is wrong or unset"
Every things seems to be ok in the backend. @sonic69 : We already had a backend access. The link that you provided is a product page link with your template, not with the default template of Joomla called protostar. Could you provide a link to such page please ? 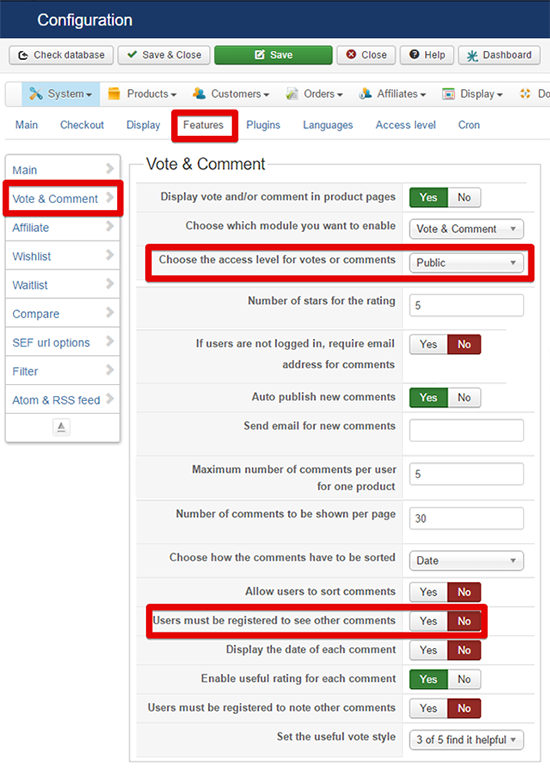 @Carolek : From what I can see on your link, I actually don't see the vote/comment form at all. Apparently, either you've turned restricted the voting/commenting to either only registered users or to only users who already bought the product. Could you check on that ? 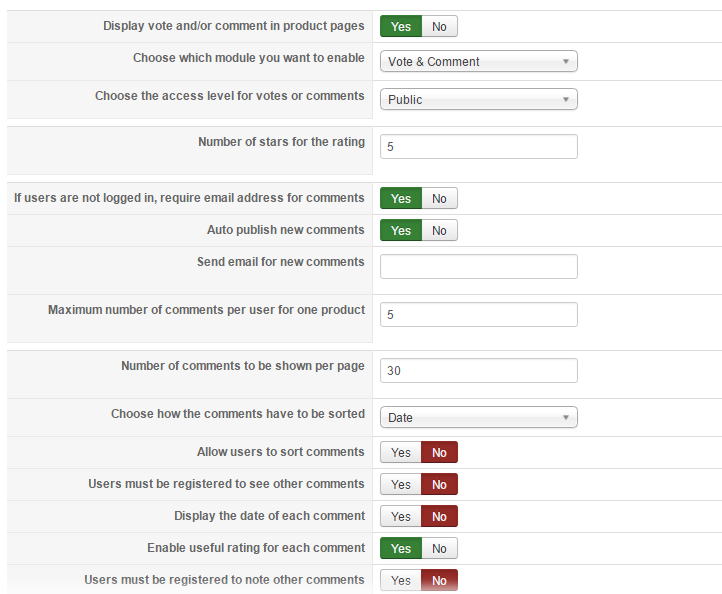 Yes, the vote is restrict to registered users only. But also when I log on, I can see only the comment field and there is no stars. I open the vote to all for you so you can see this. @Carolek : If you look at the CSS for the stars HTML with the developer tool of your browser, you'll see that there is no CSS coming from HikaShop to style them. And if you open the CSS file of HikaShop ( yaeliq.com/media/com_hikashop/css/frontend_custom.css ) that you can find in the header of the page, you can see that you're basing your CSS of HikaShop with the version 2.3.0 which didn't contain the new CSS that is used by the new vote and comment system. @sonic69 : Yes, I know that. And I tried to change the default template to use the protostar template, but it didn't do anything. So that means that the menu item of your link has a template assigned to it. But I don't know which one and you have 20 different templates. So I don't want to spend an hour trying to figure out how your website is structured, especially since you didn't purchase HikaShop and that we usually only provide such advanced user support to customers who purchased our products, and that the problem likely comes from a template customization and isn't inherant to HikaShop. So could you please provide a link where we can see the product page with the protostar template ?